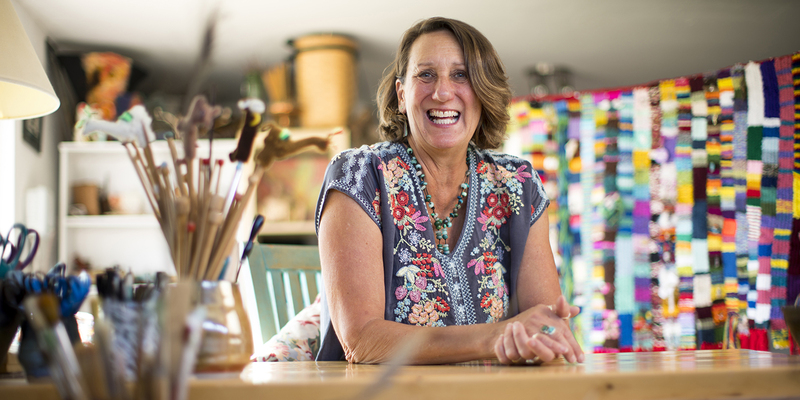 Lifelong teacher, artist, activist and advocate Brecia Kralovic-Logan ’77 (BA), ’80 (MEd) likes to call herself an “artivist.” She puts her talent and passion to use helping those less fortunate find a voice and gain a sense of empowerment. With her latest project, Kralovic-Logan is reaching across the globe, encouraging women to literally weave their stories into evocative pieces of cloth. Through Women’s Woven Voices, an international collaborative art project, Kralovic-Logan will collect the pieces and sew them together, assembling what she hopes will become a moving and unique visual display. The inspiration came to Kralovic-Logan after a women’s festival she organized in 2017 in Vancouver, Washington. Out of six women who were invited to speak, five shared with the crowd that they’d been sexually abused as children. By the end of the event, three quarters of the participants revealed they’d suffered abuse as well. But Kralovic-Logan seeks something more tangible than the spoken word. She’s chosen the art of weaving for its symbolic and literal effect; as a way for women to showcase their stories, while also sharing them verbally with one another, and if they wish, with her as well. While all participants are invited to send her something in writing, no one is obliged to. “Each woman weaves a story cloth. They send it to me, I stitch it together, and at the bottom I add a red fringe to three out of every four cloths, randomly,” she says. The fringes call attention to sexual abuse and domestic violence, creating what she hopes will be a talking point for those who view the finished work. Her aim is to ultimately connect at least 1,000 pieces by the year 2020, generating a finished tapestry 167 feet long. “My vision is that most women will share their stories in small groups, and that the experience they’re having will be transformative for them,” she explains. Many of the small groups Kralovic-Logan envisions have already formed organically, with women in a given community inviting other women to talk and share and weave together. On her website, she offers free weaving kits, along with instructional videos and images of completed works. She also hopes to attend many workshops herself, with preliminary plans already underway to travel as far away as Guatemala and India. “The hope is that this is a catalyst to help women build their own courage, to make powerful decisions for their own lives,” she says. Those words sound familiar in the era of the #MeToo movement. Kralovic-Logan sees serendipity in the likelihood that Women’s Woven Voices will benefit from #MeToo’s momentum and widespread publicity. “I think it’s absolutely timely,” she says. “The roots of #MeToo began a long time ago.” Her approach is complementary, offering women a novel form of expression and aiming for deeper levels of impact.